The Thunder Bird yoga blanket with tassels will add color to your yoga studio or your favorite spot to practice yoga is more than just a yoga prop! These blankets are great for restorative yoga, meditation, blankets, or to lend support for yoga positions when a bolster is too large. The Yoga Blanket can be used for more than a yoga blanket; blankets can be used as picnic blanket, beach blanket, and more! These Thunder Bird yoga blankets are available in a verity of colors, they can be easily machine washed. Mexican Yoga Blankets will hold their color, and will not fade in the washing machine or in the sun. Thunder Bird blanket will have 8 to 16 distinct bird patterns in the length of the blanket. Note: Blanket will sometimes be labeled100% Acrylic, this is only a misprint. 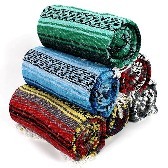 All Mexican Blankets are a mixture of Acrylic, Polyester and Cotton.